Madumbi Sustainable Agriculture embraces a holistic approach to agriculture, providing integrated solutions from seed to fork. As partners of choice, we deliver the best biorational solutions available both locally and globally, and take great pride in providing the guidance and confidence to use them. Healthy plants start with healthy soils and healthy roots. This importance cannot be over-emphasized, especially when establishing new macadamia orchards. Building a strong foundation in the orchard before (and after) planting will pay significant dividends down the line. Sustainable soil amendments, improved nutrition and a focus on building soil life will result in stronger, healthier trees with improved resistance across the board. Root health, tree vitality and longevity can be negatively affected by soil pathogens such as Phytophthora, Rhizoctonia, Pythium and Fusarium. A compromised root system is less effective at taking up water and nutrients which ultimately has a negative impact on plant growth and yield. 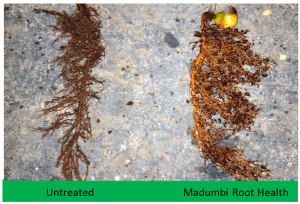 Madumbi’s root health program consists of 4 products; Eco-T, RhizoVital 42®, V12 Initiate and Madumbi Humate Granules. Figure right: Comparison of macadamia tree seedlings at TNT farms in July 2018. Seedlings on the right was treated with the Madumbi Root Health Program. The program supported exceptional root development and health. 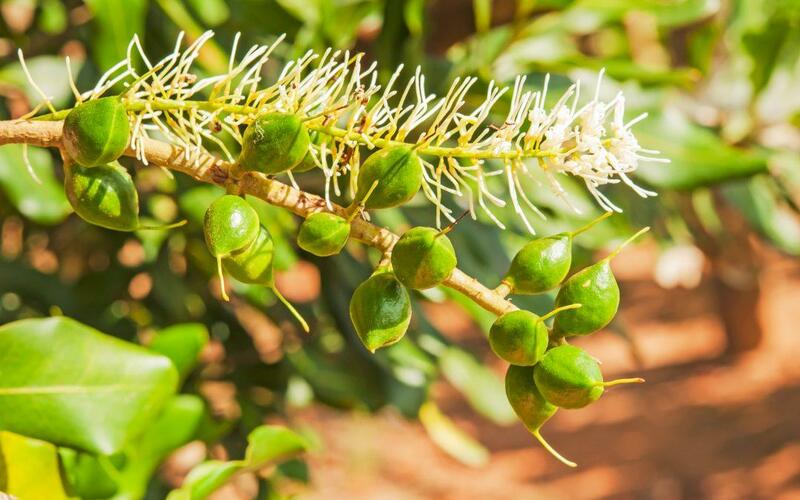 A common challenge in macadamia production is limiting physiological flower and nut drop caused by stress. Improvednut set in combination with increased resistance to physiological stress has a significant impact on final yield and crop quality. Madumbi’s technical team have made significant progress using a combination of BioStimulant products, V12 Fruit and AgriSil K50®. Figure 2: Average number of nuts set per flower raceme and standard error of the mean. Letters indicate homogenous groupings based on the pairwise t-test following the linear model analyses. * Trials were done on three poor performing blocks in Levubu in the 2016/7 and 2017/8 season. 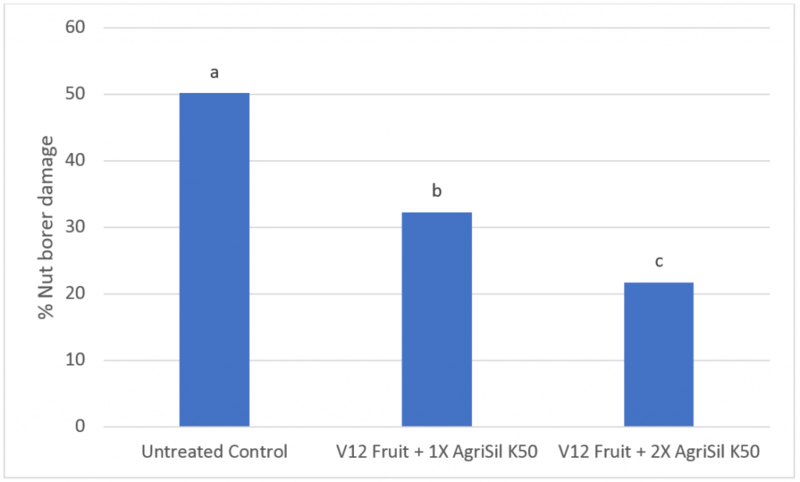 V12 Fruit was applied twice throughout the season as soon as flowering started and again 28 days later, and combined with monthly AgriSil K50® applications. 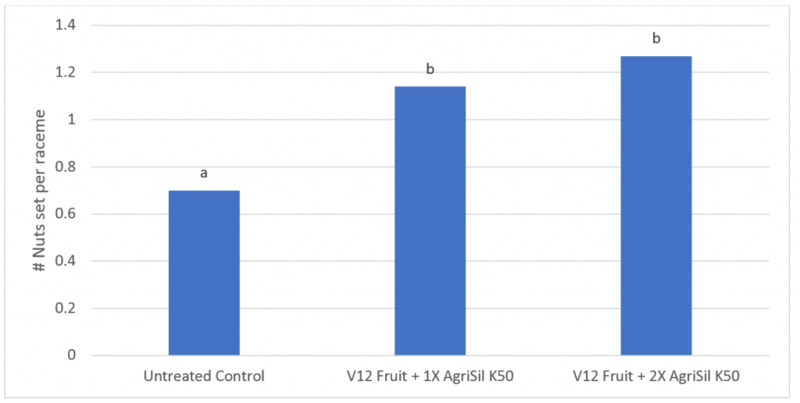 Using V12 Fruit and AgriSil K50®, nut set almost doubled per raceme, leading to significantly improved yields on these blocks. AgriSil K50® improves cell strength resulting in stronger plant cells. This has several benefits – increased resistance to abiotic stress such as heat/cold/drought, improved natural physical resistance to pest and diseases, along with improved water efficiency & nutrient translocation. In macadamia trees, AgriSil K50® seems to strengthen the husk surface making it more difficult for nut borer larvae to penetrate. This was evident in a trial done in Levubu in 2016 to 2018. Results are summarised in the figure below. Madumbi’s BioManagement range consists of pest and disease control solutions with biological origins as active ingredient, rather than a synthetic chemical. This includes fungi, bacteria and baculoviruses. Biological products are non-toxic to the environment and being residue free, with no MRL concerns, fit very well into sustainable IPM programs. Commercial macadamia farmers typically face challenges with macadamia nut borer complex, of which false codling moth (FCM) is a contributing insect. Madumbi offers two products registered for the sustainable control of FCM. The combination of Eco-Bb® and Cryptex® works particularly well at reducing nut borer and specifically FCM damage (see Figure 4). Cryptex® is very powerful in controlling FCM populations when applied early in the season as it reduces larval numbers, while Eco-Bb®’s ability to target all stages of the pest life cycle supports the program by effectively reducing surviving eggs, moth and larvae. This makes the Eco-Bb® / Cryptex® combination a well-balanced IPM strategy.It is advisable to apply both Cryptex® and Eco-Bb® in the late afternoon or at night when UV levels are low. Figure 4: Product performance (Husk damage reduction) of various treatments against nut borer complex on cultivars ‘Pahala’ (‘788’) and Mauka (‘344’) in 2014/5 in Levubu. Please do not hesitate to contact our team of experts and join us in the journey to drive sustainable agriculture for future generations. Eco-T containing Trichoderma asperellum (Reg. No. L6938, Act 36 of 1947) and Eco-Bb® containing Beauveria bassiana (Reg. No. L8469, Act 36 of 1947) are registered by Plant Health Products. RhizoVital 42® containing Bacillus amyloliquifaciens (Reg. No. B4201, Act 36 of 1947), V12 Initiate (Reg. No. B4513, Act 36 of 1947), V12 Fruit (Reg. No. B4511, Act 36 of 1947), Madumbi Humate Crystals (Reg. No. B4797, Act 36 of 1947) and Cryptex® containing Cryptophlebia (Thaumatotibia) leucotreta Granulovirus (Reg. No. L8037, Act 36 of 1947) are all registered by Madumbi Sustainable Agriculture. AgriSil K50® containing Potassium silicate (Reg. No. B3756, Act 36 of 1947) is registered by PQ Corporation. * Trials done by Dr Elsje Joubert, Maluma Boerdery.